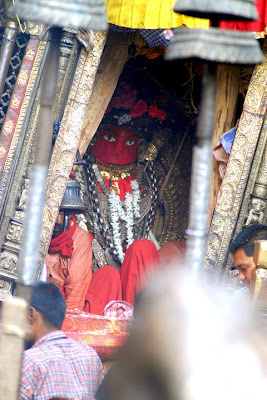 Lalitpur, April 22: LALITPUR: The Jaatra of Bungdyo (or Rato Machhindranath) - the rain god, will officially starts from today, the first day of Baisakh shukla paksha, with the ceremony of installation of the idol of Shree Avalokiteshwora Matsyendranath in the 32 hand tall chariot. The ceremony takes place at the Pulchowk in the old town of Patan. Pulling of the chariot begins 3 days later on April 25 (Wednesday). The Jatra of Machhindranath is marked every year to celebrate happiness of heavy shower at a time when famine took place in Kantipur, according to a legend. Rato Machchhindranath is considered both a Hindu and Buddhist god, who by legend was brought from Assam (India) during the reign of Lichchavi King Narendra Dev, by a farmer to Lalitpur valley in Nepal to prevent a drought during the rice season. It is known as various names, viz. Bungdyo, Karunamya, Arya Avalokiteshwora among the locals. The longest running chariot festival in Nepal recreates this event in hope for good rain. It begins with the construction of the chariot in Pulchowk, Lalitpur and ends with the Bhoto Jatra festival in Jawalakhel. It is attended by the head of state of Nepal. It is celebrated by Buddhists and Hindus of Newar community. It is celebrated by pulling the chariot to different places in the town of Patan. The name "Rato Machchhindranath" translates as "Rato" meaning Red and Machchhindranath consists of 2 words "Machhindra or Matsyendra" which means Fish (Matsya meaning fish) and Nath being the god. Rato Machchhindranath has been worshipped as a god of rain and the festival starts just before the monsoon arrives in Kathmandu. Day 4: May 13 - First day of chariot pulling. Follows the smaller chariot of Min-nath that comes to receive the Rato Matsyendranath. Day 11: May 21 - Coconuts dropped from top of the chariot. Day 12: May 22 - Ratha will be pulled by women only in early morning. View event schedule in year 2012. The event dates vary with the condition of the ratha and position of stars. Everyday the pulling starts at around 5pm till around 7pm, except for women's pulling day. Day 11: May 4 - Ratha pulled by women only in early morning. There are two Machhindranath in Kathmandu. One is in Asan tole and the other is in Machhindrabahal at Lalitpur. Machhindranath is very popular in Nepal because it is in addition with it’s ancient Bhoto jatra; on which day the Government of Nepal’s officials get government holiday in the capital but not through out the country. This festival starts during the Baisakh dark fortnight (MAY). A huge tall chariot has been prepared a few days before the inception of the festival. The chariot voyage starts from Pulchok. The distance of starting point and the Machhindranath’s temple is about one kilometer far in between. A 32 hands high pole's chariot has been prepared by hard labour, which is made out of the cane, wood, bamboo. Before starting the voyage the committee offers cow donation to the priest. On this day Machhindranath’s and Minanath’s temple is just 1020 meter’s distance in between to each other. Minanath is regarded as the creator God and Machhindranath has been regarded as the breeder god. According to the historical belief Minanath’s temple was built by Lichhabi King Amsubarma and Machhindranath was built at the time of King Narendra Dev. There is a very interesting myth regarding to the origin of lord Machhindranath. A long time back there broke out a great draught; and a fearsome famine existed there in the country. Because of no rainfall the countrymen were very much terrified with havoc. It was because the Nags who were the cause of the rain; were captured by lord Gorakhnath. Lord Gorakhnath and Machhindranath are believed to be father and son respectively. Once lord Gorakhnath had come to visit Nepal. He was very much hungry and badly was in need of food. In the evening he rested at a woman’s house who was believed to be a witchcraft practitioner. Because of his much hunger Gorakhnath continued to eat a lot but the woman also relentlessly went on serving him the food. Finally Gorakhnath became very much surprised on how the waman has been providing him the food? Also Gorakhnath is believed to the true feature of the Lord Shiva and if he wishes he could swallow the whole earth as well. That’s why Gorakhnath was very much surprised to the woman; and he saw there nine headed ridiculous snake helping her to serving the food continuously. Gorakhnath became very much angry with the Nag and the woman; then he carried the Nag with him in his pocket and started to live at Mrigasthali in Pashupatinath. He had captured the Nags and brought them in his custody. So because of this there was no rainfall in the kingdom. Myths believe that later the king went to bring Machhindranath from India to worship for rainfall in the country. Gorakhnath and Machhindranath were the father and son. So when Gorakhnath heard that his son Machhindranath has come to Nepal, he then hurriedly went to look his son. In the mean time the Nags (serpents) who had the power for the rain were released when he went to meet his son leaving that place; the there appeared a heavey shower in the country immediately by the Nags. Since then it’s believed that the havoc disappeared from the country and the situation was improved nicely forever. So that’s why the valley people worship to lord Machhindranath. Different writers have collected different legends on this aspect. However the knowledgeable local elders say this temple was made by Lichhavi King Narendra Dev and the lord’s idol was also consecrated by him brining from Kamuru Peeth of Assam India when there was a great famine in the country. When the chariot procession starts thousands of people assemble to observe and worship the fair. On the first day it’s carried out pulling by all towards the Ganabahal; and on the second day to Sundhara; and on the third day to Lagankhel. Then it rests there for two three days. The place where it rests, every night and morning people come to worship there to the chariot. After reaching Lagankhel one coconut ball is dropped from the top of the chariot. Its believed that if some one becomes able to grab the coconut, then his wishes will be fulfilled. So many people compete to catch the dropped coconut. The coconut receiver again offers the coconut to the chariot with some donation. After that the chariot reaches at Thali and in the next morning only the women pull the chariot. Since the beginning of the Rathyatra (fair) the traditional Newari bands are played. Also the Nepal Government’s Sarduljung battalion plays their band along with the Jatra. Also there, the seventeen century’s King Siddhi Narshing Malla’s warring sword is demonstrated by keeping it in a parasol. After reaching to Thahiti tole the chariot remains there for few days. After a few days the knowledgeable prophets forecast the auspicious day to demonstrate the Lord Machhindranath’s Bhoto (vest), which is called the “Bhota Jatra”. Thousands of people along with the foreigners amass there to look his Bhoto Jatra. A grand ceremony takes place on that day. Previously the king and Queen also used to come there to grace the fete but now the head of the Nepal government come there and government officials in the valley get government holiday to his day. People herd there to look the lord’s Bhota (vest) because they believe that after looking the Bhoto definitely some good luck comes for them. At the last the chariot is dismantled and the lord is taken to Bugmati, which is about 5, 6 kilometer’s distance, from Machhindranath temple; where Machhindranath resides there for a few month; then again he’s brought at Machhindranath at Jatra inception time. He is brought from there only after the Prophet calculates for the auspicious day. Minanath’s idol is taken at his respective temple itself. Every year the chariot is dismantled at Pulchowk but in every twelve year it should be taken to Bungmati itself to be dismantled. There is a very interesting legend regarding to this “Bhoto Jatra”. Once the Nag Raj went in search of a physician. Lastly he met to a Baidhya (herbal Physician); and he took to the Baidhya in side his water kingdom (pond) at Karkotaka Daha (Pond). This Karkotaka Daha is situated towards the southern side of Kathmandu. The physician healed the Nagin (queen serpent) and the King Nag became very happy. Then he rewarded him an invaluable Bhoto (vest) decorated with so many precious diamonds. Then the Physician returened back very happily at his home. One day the Baidhya went to transplant paddy in his field. He unfastened his Bhoto while he was working; and kept in near by there somewhere. In the mean time a Giant arrived there and stole his invaluable Bhoto; then the physician became very much sad and enraged. One day when there was a broke out a terrible fighting in between of them. No one could win the fight. Finally the case was field at the King’s court for the final settlement. The king was not satisfied from both side’s evidence; and lastly he decided to offer it to lord Machhindranath by amassing a huge gathering and demonstrating there to all. This is the same Bhoto, which is demonstrated till to this day in Lagankhel Kathmandu; which is called the “Bhoto Jatra” by all. It’s believed that Lichhibi king Gunakam Dev had started the practice of this fete. Kathmandu, Jun 19: The state-owned oil monopoly, Nepal Oil Corporation has hiked the prices of diesel and kerosene by Rs 4 effective from Tuesday. With this, diesel and kerosene will cost Rs 93. However, the prices of petrol, LPG, aviation fuel has not been jacked up. The perennially cash-strapped corporation jacked up the rates at the time when international price of the petroleum products is decreasing. Out of total of 445,974 who filled SLC examination forms, among the 419,019 students who appeared for the regular SLC examination 2068, total of 197,638 (ie 47.17%) made it thru the so called "Iron Gate". Among the total students who appeared for the test 17,760 (4.24%) secured marks in distinction, while 77,257(18.44%) passed in first division, 93,830 (22.39%) second division and 8,791(2.10%) passed in third division. More than half or 53% of the examinees, that sums to 221,341 failed the exam. Whereas in exempted category out of total of 76,979 examinees, only 10,549 (or 13.70%) of them passed. 126 students (0.16%) secured first division marks, 7,595 (9.87%) second division and 2,828 (3.67%) got third division marks. Large percentage of students, or 66,430 (86.30%) could not make it thru the exempted exam. As for the male vs female students, 51.81% of male examinees made thru the iron gate whereas the percentage of female students who passed is 42.26%. District-wise details of number of students filled form for SLC 2068 (2012). Enter your symbol number and date of birth as given format to get result with your subject marks. Exam symbol number is required. Update: Finally, S.L.C. results PUBLISHED!! According to the Office of the Controller of Examination (OCE) 247,689 students out of 528,257 examinees passed SLC 2068 exam. The number accounts to 47.16 percent of the total students appeared for the SLC - School Leaving Certificate exam this year. Congratulation to all those who got thru the iron gate. For those who could not make it this time, remember the world is not over yet. Best of luck for the next time. *Click on the "Regular" or "Exempted" to view the results in Google Docs Viewer. *Enter your serial number in the search box in top right corner > hit enter. *Or you can also download the files > File > Download and view in your favorite applications. Kathmandu, Jun 13: The Office of the Controller Examinations, Sano Thimi, is making provisions to publish the School Leaving Certificate (SLC) results by Wednesday. According to Deputy Controller at the OCE Ambika Prasad Regmi, the preparation for publishing this year's SLC result has reached its final stage. However, if technical problems surface, the result will be published on Thursday. A total of 528,257 candidates, including 445,974 in the regular stream and 82,283 in the exempted stream, appeared in the SLC examinations this year. yalamandu.com will try to publish SLC results on this site as well, as soon as possible. Results will be published at following sites as well. SONAMU (STS 1301) [i] is the first tropical storm (typhoon) in the year 2013 in the western North Pacific and the South China Sea (Jan 3, 2013). The word Sonamu means Pine tree. The naming adopted by the ESCAP/WMO Typhoon Committee, is contributed by DPR Korea. The tropical cyclone in this region occurred relatively very early compared to occurrence of typhoon in recent years. Last year the first typhoon was announced by JTWC/JMA on March 29th only. A Tropical Cyclone is a storm system characterized by a low-pressure center and numerous thunderstorms that produce strong winds and heavy rain. Tropical cyclones strengthen when water evaporated from the ocean is released as the saturated air rises, resulting in condensation of water vapor contained in the moist air. They are fueled by a different heat mechanism than other cyclonic windstorms such as nor'easters, European windstorms, and polar lows. The characteristic that separates tropical cyclones from other cyclonic systems is that at any height in the atmosphere, the center of a tropical cyclone will be warmer than its surroundings; a phenomenon called "warm core" storm systems. The term "tropical" refers both to the geographical origin of these systems, which usually form in tropical regions of the globe, and to their formation in maritime tropical air masses. The term "cyclone" refers to such storms' cyclonic nature, with counterclockwise wind flow in the Northern Hemisphere and clockwise wind flow in the Southern Hemisphere. The opposite direction of the wind flow is a result of the Coriolis force. Depending on its location and strength, a tropical cyclone is referred to by names such as hurricane (/ˈhʌrɨkeɪn/, /ˈhʌrɨkən/), typhoon, tropical storm, cyclonic storm, tropical depression, and simply cyclone. While tropical cyclones can produce extremely powerful winds and torrential rain, they are also able to produce high waves and damaging storm surge as well as spawning tornadoes. They develop over large bodies of warm water, and lose their strength if they move over land due to increased surface friction and loss of the warm ocean as an energy source. This is why coastal regions can receive significant damage from a tropical cyclone, while inland regions are relatively safe from receiving strong winds. Heavy rains, however, can produce significant flooding inland, and storm surges can produce extensive coastal flooding up to 40 kilometres (25 mi) from the coastline. Although their effects on human populations can be devastating, tropical cyclones can relieve drought conditions. They also carry heat energy away from the tropics and transport it toward temperate latitudes, which makes them an important part of the global atmospheric circulation mechanism. As a result, tropical cyclones help to maintain equilibrium in the Earth's troposphere, and to maintain a relatively stable and warm temperature worldwide. 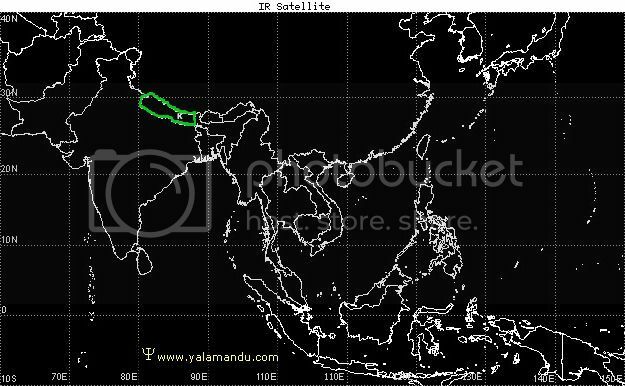 Kathmandu, June 11: National Seismological Center web portal reported an earthquake hit eastern border, Panchthar - Sikkim today. Earthquake measuring M4.5 was epicentered in district of Panchthar - Sikkim at 04:36 UTC on June 11 (or 10:21am local time same day). No records of casualties reported so far. Pokhara, June 9: USGS reported an earthquake hit Pokhara, the Himalayan city in Western Nepal today. Earthquake measuring M4.8 was epicentered at 14km NE from the city at 07:54 UTC on June 9 (or 1:39pm local time same day). Further details still to come. Update: According to National Seismological Center, Nepal the magnitude of the tremor measured 5.1 on the Richter scale. Click here for details of the earthquake on USGS website. POKHARA, JUN 09 - An earthquake measuring 5.1 on the Richter scale jolted Pokhara on Saturday afternoon damaging few houses. National Seismological Centre said that the quake was centered 23 kilometers North in Thumkodanda and Namarjung VDC. Police informed that a wall of houses belonging to Radha Krishna Subedi and his son Shiva Raj were cracked due to the quake. Similarly, the building of Area Police Station also suffered minor damages due to the quake. POKHARA, June 9: A 5.1 magnitude earthquake hit Pokhara at 1:39 pm on Saturday afternoon. According to the National Seismological Center, the epicenter of the earthquake was at Thumakodanda, 30 Kms east of Pokhara. According to the Kaski police, rear parts of two houses belonging to Radhakrishna Subedi and his son Shivaraj at Talbesin of Lekhnath Municipality-10 collapsed after being struck by the quake. Similarly, cracks were also seen on the walls of the Regional Police Office building at Hansapur due to the tremors. However, no human casualties have been reported so far. The tremors were felt for ten seconds at Kaski and its surrounding districts, including Tanahun, Lamjung and Gorkha.